Jun-Hong Zhao and P.D. Asimow (Zhao and Asimov, 2018; and this LIP of the Month) have made an important discovery of a ca. 650 Ma mafic-ultramafic dyke swarm in South China that extends for at least 400 km and which they infer to be associated with continental rifting. This scale and setting suggest a link to a Large Igneous Province (LIP). They infer an origin by passive extension rather than active extension, but I think further work is required to rule out plume involvement. Their discovery is significant because ca. 650 Ma LIP magmatism is rare globally (Ernst, 2014, LIPs, Cambridge U. Press, 653 p.). Division of Geological and Planetary Sciences, California Institute of Technology, Pasadena, California 91125, USA. Zhao, J-H., Asimow, P.D. (2018). Formation and evolution of a magmatic system in a rifting continental margin: Neoproterozoic arc- and MORB-like dike swarms in South China. Journal of Petrology, v. 59, p. 1811-1844. Mafic and ultramafic dykes constitute a common expression of crustal extension and serve as major conduits for transferring magmas to the upper crust. Unlike subduction-related mafic-ultramafic rocks produced by hydrous melting of mantle wedges in arc settings, those from rift-related tectonic settings are linked to asthenospheric upwelling and often to deep mantle plumes. Previously subduction-modified lithospheric mantle may also be involved in their petrogenesis. Therefore, mafic-ultramafic dykes contain important information about dynamic processes accompanying the breakup of continents, the nature of the lithospheric and asthenospheric mantle (structure, thickness, composition, geothermal gradient). A prime example of continental rift magmatism is found in South China. Numerous ca. 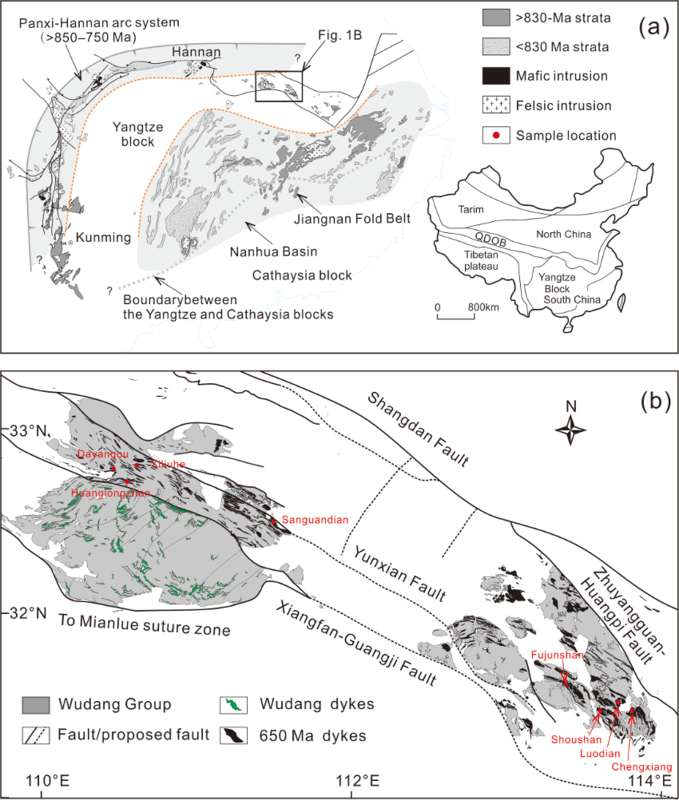 650 Ma mafic and ultramafic dykes were emplaced in the South Qinling Belt of the northern margin of the Yangtze Block, interpreted as a rifted continental margin (Fig. 1). The dykes from the eastern South Qinling Belt are composed of olivine gabbro and gabbro that show low SiO2 (42.60 to 49.56 wt%) and high MgO (4.96 to 14.41 wt%). MELTS modeling reveals that many of these dykes could have originated from a common primary magma that underwent extensive fractional crystallization of olivine + plagioclase + clinopyroxene followed by accumulation of phenocrysts in most samples. They show arc-affinity trace-element compositions characterized by enrichment of LILE and LREE and depletion of HFSE. They have high initial 87Sr/86Sr (0.705192 to 0.706622), negative εNd650 (-7.11 to -4.45), and very low 206Pb/204Pb (16.71 to 16.98), 207Pb/204Pb (15.36 to 15.42) and 208Pb/204Pb (37.17 to 37.48). Their magmatic zircons preserve relatively homogeneous δ18O (+4.95‰ to +6.41‰) and highly variable εHf (-0.5 to +10.0). Both chemical compositions and modeling results suggest that dykes from the eastern South Qinling Belt were derived from a lithospheric mantle that had been extensively modified by earlier subduction and further underwent strong contamination by the ancient granulite lower crust (Fig. 2). By contrast, the mafic dykes from the western South Qinling Belt have relatively high SiO2 (44.97 to 52.09 wt%) and low MgO (4.73 to 9.40 wt%). They fall into two groups that show N-MORB and E-MORB-like elemental character, respectively. Both types have low initial 87Sr/86Sr (0.703752 to 0.706850), positive εNd650 (+2.75 to +5.85), and scattered ratios of 206Pb/204Pb (17.25 to 18.42), 207Pb/204Pb (15.44 to 15.55) and 208Pb/204Pb (37.37 to 38.74). Their zircon δ18O (+3.64‰ to +5.33‰) and εHf (+10.2 to +14.8) values are also significantly different from those of the eastern South Qinling Belt dykes. The chemical evidence suggests that mafic dykes from the western South Qinling Belt originated from a heterogeneous asthenospheric mantle (Fig. 2), one part of which may have been enriched by OIB/seamount subduction. These mafic dykes underwent only minor modification in the lower crust but are contaminated by high temperature hydrothermally-altered supracrustal materials. Generation of the voluminous mafic and ultramafic dykes in the South Qinling Belt occurred in a rifting continental margin after a long period of subduction. Their diverse origins and complex geodynamics suggest that magmatism in rifting continental margins is not only controlled by the structure of the lithosphere and upwelling of the asthenospheric mantle, but also by interaction between melts and continental crust (Fig. 2). The chemistry of the mafic-ultramafic dykes in this study (presence of N-MORB and absence of OIB character) suggest that an active magma plumbing system may have evolved beneath a “non-volcanic” passive continental margin. Fig. 1, A simplified geological map showing the distribution of the mafic-ultramafic dykes in the South Qinling Belt at the northern Yangtze Block. Fig.2, A sketch map showing generation of arc-affinity and MORB-like mafic-ultramafic rocks in the South Qinling Belt in a rifted continental margin. The arc-affinity rocks were partial melts of the previously subduction-modified lithospheric mantle due to upwelling of asthenosphere. 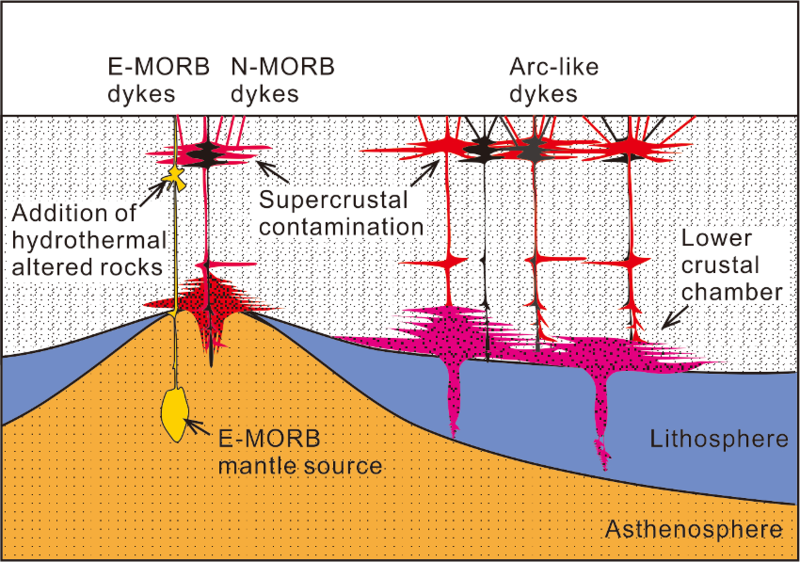 The N-MORB-type rocks were produced by decompression melting of the normal asthenosphere mantle, whereas the E-MORB-type rocks by melting of the locally enriched mantle source. The dykes underwent two stages of evolution in the lower ancient crust and the upper crust associated with fractional crystallization and mineral accumulation.